Createspace Independent Publishing Platform, 9781479138753, 256pp. Attending Tivedon should have been the most exciting time in Jayl's young life. Along with his sister Myah, they journey to Tivedon and are quickly caught up in the excitement and eccentricities of the school and its teaching elders known collectively as 'The Circle of Tivedon'. Enemies and alliances are swiftly established between the other students that come from across the realm of Tiertyn. Yet, as they begin the next level of their scholastic study in the finer points of diplomacy and governance, grim tidings reach the castle walls. An ancient evil is on the rise threatening to plunge the land into darkness once again. Tensions begin to rise within the walls of Tivedon as unexplainable, dreadful events occur forcing the 'Circle of Tivedon' to act. The situation worsens as accusations of a traitorous plot involving friends of Jayl and Myah's from back home and a fellow student's sovereign land arrive at Tivedon. This development ensnares Myah in a conspiratorial and secretive undertaking at the behest of 'The Circle of Tivedon'. Jayl, who discovers a temperamental magical source within himself, becomes the unwitting focal point of Tivedon's elders' plans to defend Tiertyn against the army of the resurrected evil Lord Rimyaroth. Unfortunately, before plans are complete, the suspicious death of one of Tivedon's elders followed by the murder of the befriended Captain of the Guard lands an unjustly accused Jayl into Tivedon's cells. It is here that Jayl learns of a long ago hidden talisman which will aid in their fight, which he must find and return. A hasty and harrowing escape from the school, which has fallen under the sway of the enemy, follows under the cover of darkness. With foes now swelling on all fronts, the elders must split the students into three groups to have any hope of stemming the tide that threatens them. Myah, along with one of the two remaining Tivedon elders, make their way to the city of Sieli. Their hope is to vindicate her captured and accused friends as well as turn the favour of an opportunistic King to their cause. The second group, led by the other Tivedon elder, races to join defenders that are hastily forming the first line of defence against the massing army of Lord Rimyaroth. Lastly, and much to Jayl's chagrin, he is paired with two menacing and determined school rivals on his quest to find the talisman. A perilous mission, it remains the last vestige of hope to battle against the dark magic of Lord Rimyaroth. With the unlikely heroes and heroines heading in separate directions, three diverse journeys begin. Ryan Shorten, having been a fan of all things magical since he was young, turned a love of reading into a passion for writing. 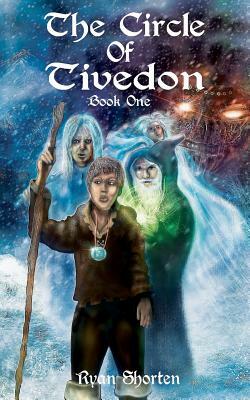 The Circle of Tivedon is his debut novel and the first book of The Circle of Tivedon series. Written for a Young Adult audience, the story explores building relationships and adolescent responsibility in the face of adversity. Engaging characters that reflect the diverse backdrop of the realm of Tiertyn will all be forced to make the toughest decisions of their lives.